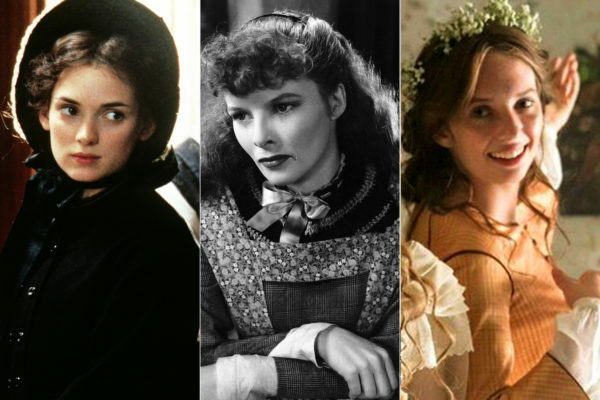 There have been no fewer than thirteen different adaptations of Little Women on film–eight for the big screen and five for television, beginning in 1917 with a silent production from Britain, all the way up to next year’s highly anticipated production headed by Lady Bird‘s Greta Gerwig. Here’s a look at some of the memorable versions that you may recall…and one that we all wish we could forget! Little Women of 1949 was an MGM spectacular and was of course filmed in Technicolor. It was representative of Hollywood’s “Golden Days” when the films were lush and sappy, with realism kept at bay. A 31-year-old June Allyson played 17-year-old Jo–whom critics opined, ” while oozing sentimentality, can’t hold a bayberry candle to Hepburn’s Jo.” Elizabeth Taylor was an overly petulant Amy, Margaret O’Brien a much-too-young Beth, and future Rat Packer Peter Lawford was Laurie. Nevertheless, it was one of the biggest box-office hits of 1949. This version of the film was very well received and rated a very strong 91% on Rotten Tomatoes. Roger Ebert of the Chicago Sun-Times awarded the film 3½ stars, calling it “a surprisingly sharp and intelligent telling of Louisa May Alcott’s famous story, and not the soft-edged children’s movie it might appear.” It’s probably the one best remembered by most of you–Winona Ryder as feisty Jo, Kirsten Dunst as precocious Amy, Susan Sarandon as strong and loving Marmie, and Christian Bale as a dreamy and loveable Laurie that every pre-teen girl fell in love with. Coming next year will be yet another version of Little Women, this time directed by Greta Gerwig of Lady Bird fame, and starring Saoirse Ronan as Jo, Emma Watson as Meg, Laura Dern as Marmie, Timothee Chalamet as Laurie, and Meryl Streep as the always pompous Aunt March. This eagerly anticipated retelling of the tale is scheduled to arrive Christmas 2019.